Many of you have asked about starting a home yoga practice. I hope to shed some light on what can seem a daunting step for many new practitioners, and even the experienced practitioner. The benefits of a home yoga practice are manifold. It complements a regular studio practice and fills in on the days you’re unable to get to the Shala for a class. The self knowledge you gain is a powerful tool on your yoga journey. Many misimpression’s of what a home yoga practice should be like, keep practitioners from taking the first step. Students may feel that a home practice should be the same intensity and length of a regular class, but a simple 10 minute routine can be incredibly beneficial for both your physical and emotional well being. Select out a space in your home, somewhere uncluttered inside or outside that will accommodate you and your mat. A small space will do. It doesn’t have to be fancy but feel free to adorn it with candles or anything else that helps get you onto your mat. Carve out the time in your life to accommodate a yoga practice. A consistent practice is important. A steady once a week practice is better than a daily practice for a week followed by nothing for a month. Mornings, lunchtime or an evening practice may suit your schedule. Work around family, children and your job commitments and see what works best for you. Let yoga fit into your life, not the other way around. Don’t be too hard on yourself if you don’t get it right. Keep trying. Anytime you can step onto your mat is a good time. Keep your mat rolled out and ready if possible. If not keep it in easy reach. Set out your yoga clothes the night before. This really saves you a few minutes especially if you’re doing a morning practice. Be attentive in class. Decide which asanas you would like to incorporate into your home practice. Do the asanas that you love. It will keep you coming back to your mat for a regular practice. Learn Surya Namaskar (Sun Salutations). The combination of asanas that make up this sequence are incredibly beneficial. If you do nothing else, do this. Slowly add on asanas to your practice, one or two standing poses, seated poses and a finishing pose. The Ashtanga sequence is a great place to draw inspiration from. Now that you have the tools to set up a home practice, give it a try. “Fall down seven times, get up eight”. This Japanese proverb so aptly describes the yoga journey, especially as you embark on a home practice. If you don’t get it right the first, second or third time, its okay. Try again. Don’t seek out a perfect practice, it doesn’t exist. Accept where you are now and your practice will unfold. contact Diego to discuss further details. On enrollment for the Winter Teacher Training you will able to attend all of the last 4 Saturday afternoon workshops, in preparation for your Teacher Training at no extra charge (valued at R1800). Is the Yoga Teacher Training for you? Do you want to be immersed in the study and practice of holistic living and health? Do you want to be a part of a comprehensive study and practice of traditional yoga? Do you want to expand the awareness of your body and mind’s greatest potential? Do you want to be adept in the practice of yoga to enhance your own personal practice? Are you ready to live out your passion and a vocation of teaching to promote yoga and holistic living? The inspiration and focus of the training will be based on alignment and vinyasa yoga. As a part of the course electives you will be trained in the science of Ayurveda. You will learn to integrate a lifestyle of holism and awareness. > Develop greater awareness of your physical balance and strength through the practice of yoga postures. > Become adept in the understanding and physical practice of the yoga postures, deepen and establish a sustainable practice for your personal growth, longevity and health. > Learn the science of conscious breathing to soothe the nerves and emotions. Practice the art of mental and physical relaxation. > Learn comprehensive alignment based hatha yoga techniques. This forms the foundation of a sustainable and healing experience of yoga. > Learn the art of physical adjustments to align the body thereby deepening the benefits of the yoga practice. 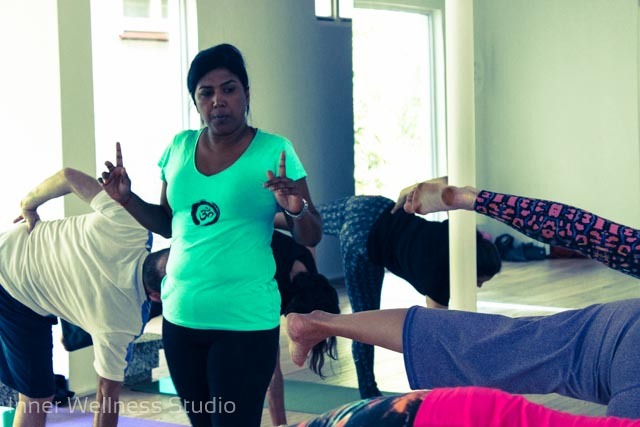 > Learn physically active and dynamic sequences to bring flexibility and strength to the body and to enhance your teaching skills. > Learn traditional holistic yoga philosophy to consciously understand the essence of yoga. > Be introduced to Ayurveda the sister science of yoga to compliment and complete your yoga practice and lifestyle. > Learn the art behind the specific sequencing of yoga classes for therapeutic benefits and to prevent injury. > Deepen your experience and understanding of the subtle energetic anatomy of the body. > Study anatomy and physiology of the body and mind in relation to yoga and meditation. > Get hands on learning experience of teaching yoga classes in a supportive and learning environment within the teacher training program. >Develop the framework to confidently and professionally teach yoga classes. √ Should you wish to gain the understanding of yoga and meditation for your own personal growth. √ If you are dedicated to living a healthy and holistic lifestyle. √ Want to develop in the field of alignment based hatha yoga. √ You have a natural ability to inspire others to be more aware of their health and spirituality as a yoga teacher. √ Those new to yoga will be immersed and established in the understanding and practice of yoga. √ Existing yoga practitioners will learn yoga essentials to deepen and refine their yoga practice, that cannot be fully explored in yoga classes. √ Qualified teachers will enrich their existing yoga practice and knowledge to gain continuous education credits. Diego is the founder of Inner Wellness Studio in Durban, a holistic health care practice specialising in holistic health, integrative nutrition, yoga and meditation. After dedicating the last 8 years to studying, practicing, living and teaching yoga, Diego has received the credentials as an Experienced Registered Yoga Teacher (E-RYT) with Yoga Alliance International. Diego’s Yoga School runs 200hr Yoga Teachers Training Certificate Courses. 9 weekend Modules will make up the 200hr training. The modules will take place every alternative weekend. Typical schedule will include Friday 5.30- 7.30PM, Saturday and Sunday 6-5pm. • Set of 4 foams for shoulder stand and a yoga belt. • On completion you will receive an internationally recognised yoga teacher training certificate accredited with Yoga Alliance International. Should you wish to enroll for the training course, contact Diego to discuss further details. To secure your place on the training a *non-refundable deposit of R3600 is to be paid. 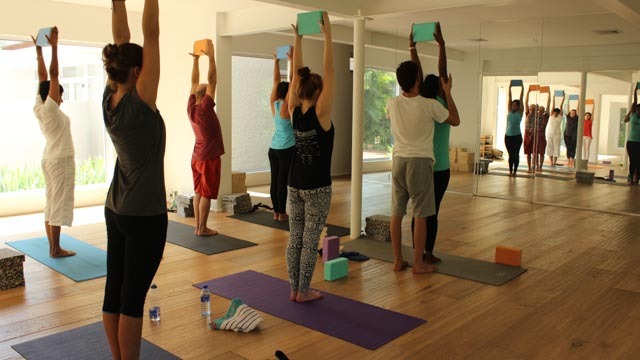 The course takes place in a private yoga studio on Musgrave Road, Durban Yoga Shala. The studio has been fully equipped with all the yoga props; blocks, bolsters, belts, blankets, yoga chairs and wall ropes. During the course the student teachers will be exposed to the use of all these specialised supports. The mind is designed to think. We think thousands of different thoughts everyday, this is the distinguishing characteristic of human beings. It is difficult to escape the incessant chatter of the mind! The ancient Yoga and Buddhist scriptures describe the concept of the ‘monkey mind’. The mind is compared to a monkey drunken in the confusion of thought. It is a mind that is constantly chattering away; jumping from thought to thought; judging and indulging in fears and fantasies usually about the past or future and requiring great stimulation. We can all relate to this, I’m sure! We lead busy lives. Our responsibilities to our families, community, work colleagues and to ourselves are many. It is difficult to keep abreast of our many commitments and we experience the many effects of stress. Scores of scientific studies have illuminated the mind-body connection in health. Stress and high anxiety levels affect the immune system and causes inflammation in the physical body, which in turn lead to many chronic diseases e.g hypertension, diabetes, arthritis and dementia. Stress affects our sleep patterns. The hippocampus is an area of the brain that plays an important role in memory. Insomnia is associated with shrinkage or atrophy of the hippocampus. This causes memory loss. The practice of yoga and meditation are antidotes to these effects of stress. A yoga asana (posture) practiced with the correct alignment, gaze (drishti) and awareness of breath, allows us to connect to the deep sense of stillness which is always within us. We experience a similar quietude when we meditate. Our energy is directed within and we quieten or ‘tame’ the monkey mind. With time and regular practice, we experience greater mental buoyancy, brightness and clarity. We make wholesome decisions and we are able to live a more well-ordered lifestyle. Neurophysiology and EEG studies have documented changes in the brain during meditation. The left prefrontal cortex is stimulated during a deep meditation practice. This area of the brain is associated with happiness, rational thought and feelings of well-being. The emotional centres in the brain become more pacific with regular meditation. We feel more in control of our emotions. We react less and respond more effectively. We have a happier perspective on life. Our physical health improves. Meditation techniques are integrated into many treatment programs for patients with asthma, recurrent sinusitis, migraine headaches, chronic back pain and other pain syndromes including pain control after surgery. Meditation or mindfulness is simplicity itself. There isn’t an instruction manual or expensive equipment, all that is needed is a commitment to a daily practice. The natural breath is the perfect point of awareness. If you prefer, you may use a short meditation mantra as a guide. An awareness of the energy in the upturned hands or on the space between the eyebrows is an effective way to be ‘present’. There are many techniques, it is best to try different options until you find a method that resonates with you. Discuss your practice with your yoga teacher. 1. Schedule 10- 20 minutes each morning and evening for your practice. Using a timer allows you to relax fully for the allocated time. 2. Sit in an upright position, either on a chair or a cushion on the floor. Maintain a straight but relaxed spine. 3. Select a place in your home where you will be undisturbed. 4. Your eyes may be closed or slightly open with a soft gaze on the tip of your nose. 5. A short breathing or pranayama practice will help you settle into your meditation. 6. Witness the natural breath. 7. Maintain an awareness of your breath at the tip of your nose. 8. Become aware of the space between the inhalation and exhalation… and exhalation and inhalation. 9. Avoid deep breathing or forcing your breath. 10. Be a silent observer using your breath as an anchor each time your mind drifts. 11. Be patient with yourself. It is difficult to escape the endless streaming of thoughts. Keep your awareness on your breath in all its vividness. 12. A meditation practice requires commitment and discipline; give yourself time to thread moments of awareness together, breath by breath. Inner Wellness Studio presents a series of yoga workshops to refine and deepen your understanding and practice of Yoga. The upcoming yoga workshops will be an immersion into the subtler workings of Yoga. Diego will teach Yoga as a systematic approach to holistic living. Learn the art of proper relaxation to restore vitality and balance back into your health. Understand the importance of integrating Pranayama into your Yoga practice. This workshop I will co present with Nalini. We are both passionate about sharing the wisdom and knowledge that Ayurveda has to offer. Ayurveda, is a sister science to Yoga and hence they compliment and work together to restore balance and health to the body and mind. After this workshop you will be inspired and equipped to easily integrate ayurvedic principles in your lifestyle and yoga practice. These workshops are suitable for anyone who wishes to deepen their knowledge and practice of Yoga. These workshops are a must if you are new to yoga, already practicing yoga or aspiring to be a teacher of yoga. 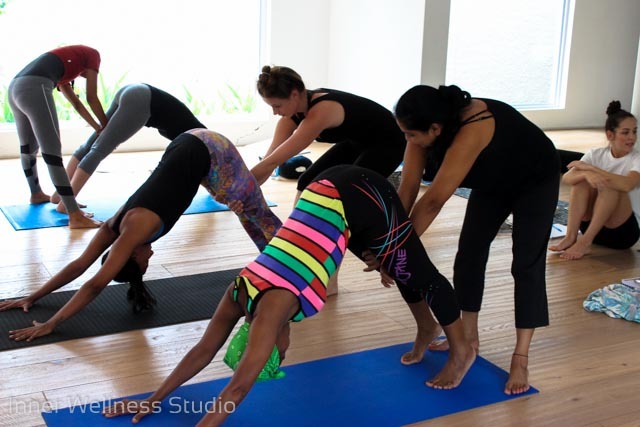 Sign up for the series of 3 workshops @ R1000 (save R200) plus get a month of yoga classes free. Contact Diego for more information or to secure your space. Inner Wellness Studio invites you to fully embrace yoga as a technology for holistic living. This course is a comprehensive study and practice of yoga. This course will give you a profound experience of yoga that will transform your body and mind. On completion of the course, you will be qualified and certified to teach yoga. Your teaching credentials will be recognised and affiliate with Yoga Alliance. Do you want to awakening your body and mind’s greatest potential? Can you imagine yourself inspiring people’s lives, health and well being? Are you ready to live out your passion and a vocation of teaching and promoting yoga and holistic living? 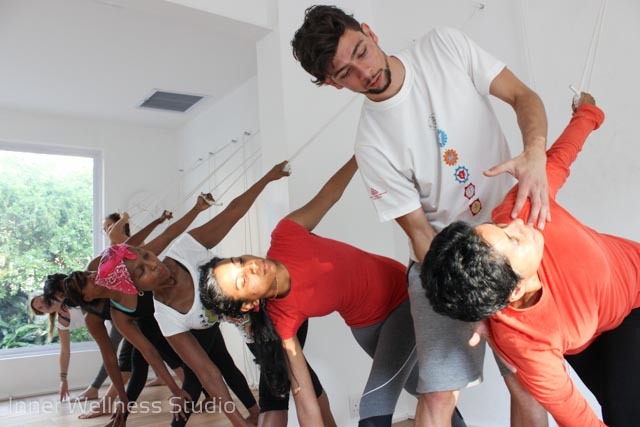 The inspiration and focus of the training will be based on strong alignment and Vinyasa Yoga. As a part of the course electives you will also be trained in the science of Ayurveda. You will take away a lifestyle of holism and awareness. Naturally you will teach and inspire others. Develop greater awareness of your physical balance and strength through the practice of yoga postures. Become adept in the understanding and physical practice of the yoga postures, deepen and establish a sustainable practice for your personal growth, longevity and health. Learn the science of conscious breathing to soothe the nerves and emotions. Practice the art of mental and physical relaxation. Learn the traditional holistic yoga philosophy. Deepen your experience and understanding of the subtle energetic anatomy of the body. Study in depth the anatomy and physiology of the body and mind in relation to yoga and meditation. Learn the most comprehensive alignment based hatha yoga techniques. Which forms the foundation of a sustainable and healing experience of yoga. Learn physically active and dynamic sequences to bring flexibility and strength to the body. Develop the framework to confidently and professionally teach yoga classes at the highest level. Learn the art behind the specific sequencing of a yoga classes for maximum benefit and to prevent injury. Gain the experience of teaching yoga classes in a supportive environment. Learn and experience the specific therapeutic benefits of yoga. Time will be spent gaining an expertise of the dynamics of the body in the practice of yoga. Physical adjustments will be learnt to aid in deepening the benefits of yoga. Regardless if you intend at this stage on actually going out and teaching yoga. Give you a new perspective to deepen your experience and practice of yoga. If you are dedicated to living a healthy and holistic lifestyle. If you want to go deeper into understanding yoga and meditation. Want to be a specialist in the field of correct postural alignment and stress management through the practice of traditional yoga. You take responsibility for your health and happiness. You are continuously seeking to grow in health and evolve in mind. You have a natural ability to inspire others to be more aware of their health and spirituality. Those new to yoga will be immersed and established in the understanding and practice of yoga. Existing yoga practitioners will learn yoga essentials to deepen your yoga that cannot be fully explored in yoga classes. Already qualified teachers will enrich their existing yoga practice and knowledge and also gain continuous education credits in attending the course. Diego is the founder of Inner Wellness Studio, a holistic health care practice specializing in holistic health, integrative nutrition, yoga and meditation. Inner Wellness Studio is a registered yoga school with Yoga Alliance. Diego has completed teacher training programs in Vinyasa and Kundalini Yoga and Meditation and after dedicating the last 7 years to studying, practicing, living and teaching yoga, Diego has received the credentials as an Experience Registered Yoga Teacher with Yoga Alliance International. 9 weekend Modules will make up the 200hr training. The modules will take place every alternative weekend. Typical schedule will include Saturday and Sunday 6am-5pm.